The Editorial Tab (found in the Dashboard) is where you’ll go to get an overview of your book’s progress through the editorial workflow. The Progress Gauge visualizes your book’s content according to its current editorial state, letting you know what you need to do now to move forward, and sometimes providing special options to kickstart your progress. Roll over any segment of the gauge to reveal additional details. Special options sometimes appear in the gauge to help you move ahead in the workflow. The Content Browser in the bottom half of the editorial tab lets you browse the book’s content filtered by editorial state, and to change the editorial state of multiple items at once. Use the drop-down menu at the top left to select an editorial state, and then click “Filter results” to show only content matching that state in the list below. You can search the filtered results by title or description using the search field at the top right. Set the Usage Rights status for individual items in the list by clicking the checkbox at the right. Select multiple items just by clicking them (or Select all visible items using the button at bottom left); then use the drop-down menu at bottom left to change their editorial state (if possible, given your user role and the current state of the items). Once a book has been published, any subsequent changes to it will go live immediately. 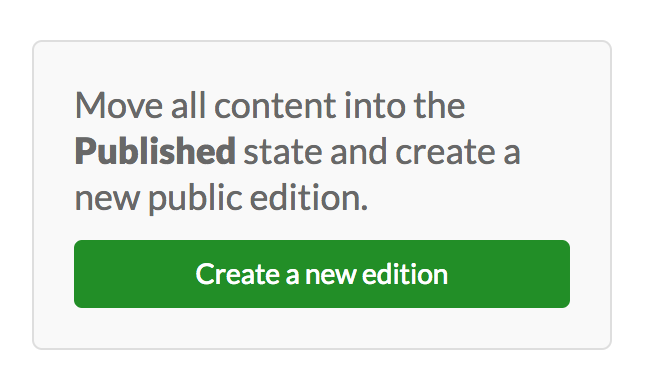 If you wish to preserve the current state of the book while still being able to make changes privately, an editor user can create an Edition. An Edition is a publicly visible snapshot of the entire book at a particular moment in time. The latest Edition of a book is what your readers will see by default. To create an Edition, all content in your book must be in the Ready or Published states. In the Editorial Tab of the Dashboard, an option to create a new Edition will appear at right. Click the button and you’ll be prompted to choose name for the Edition. 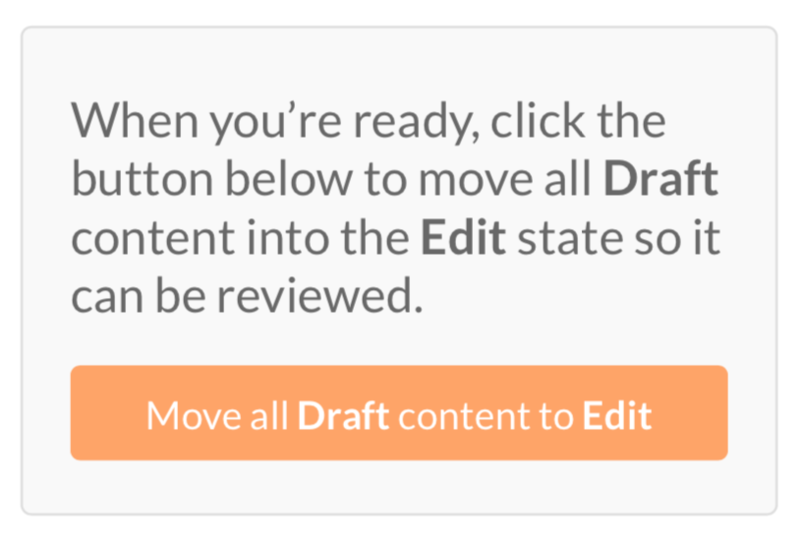 After an Edition has been created, any changes you make to pages or media metadata will be visible only to Authors and Editors in a special Edition called Latest edits, where each piece of edited content will again start in the Draft state. You’ll need to move that content through the editorial workflow to the Published state before another Edition can be created. You can click "Manage Editions" in the editorial tab to rename or delete existing editions.